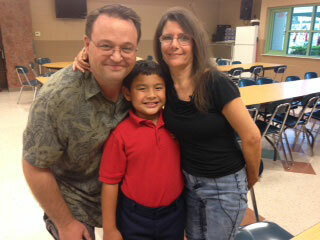 Chris and Debbie Tilley are hoping their son’s recipe lands him among the top five winners from 25 finalists. That would not only mean $30,000 for a new kitchen at Ben’s school but $15,000 for the family. Photos courtesy of Debbie Tilley. An 8-year-old student at St. Stephen Catholic School in Riverview, Ben Tilley, is among 25 finalists in a national cooking contest that could mean a new kitchen for his school, but he needs your help. The top five winners in “Ben’s Beginners Cooking Contest,” sponsored by Uncle Ben’s to promote healthy eating habits among youngsters, receive $15,000 each and $30,000 for a kitchen makeover at the student’s school. In the case for St. Stephen, the money would go to building a new kitchen; the school does not have one. Online voting for the contest ends midnight Nov. 30. Vote for and watch Ben create his recipe for stuffed bell peppers in a video at http://bit.ly/1RDhc7R. There is a limit of one vote per person/per IP address, per video, per 24 hours. This means you may vote for more than one video per day, but you may not vote for the same video more than one time in any 24-hour period. Ben is excited about his chances this year. It’s the second time he has entered the contest, the first time he has made it to the finals. 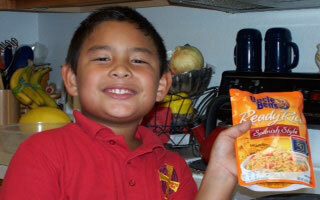 “I enjoy [the contest] because I like to cook and I like to eat, too,” said Ben, whose favorite subject is science. “[St. Stephen] needs a kitchen a lot,” added the third-grader, who hopes a new kitchen will lead to more nutritious meals for students. Now in its fourth year, the contest is designed to make the kitchen a welcoming place for the entire family by encouraging parents and kids to cook together. The contest is part of the Ben’s Beginners movement, which encourages parents and kids to spend time together in the kitchen cooking healthy meals. Research shows that children who eat with their families eat healthier as adults, are less likely to resort to quick fixes like fast food, and eat more healthy foods, including fruit and vegetables.